Nearly 15 years since the U.S. sent forces to Afghanistan, deployments haven’t gotten any easier. Army Sergeant Christopher Oglesby would be the first to tell you that. “In the month that I [first] had been in country, I had been having issues with my wife being that this was her first deployment,” said Oglesby, who’s stationed at Operational Base Fenty, Afghanistan. Oglesby, who also volunteers at the USO on OB Fenty, turned to the USO staff to both reconnect with and surprise his wife for her birthday. The USO helped him bake a birthday cake for his wife so he could surprise her over Skype. Visa restrictions and other logistics issues currently prevent the USO from operating a fully staffed location in Iraq, but the organization was able to open three unmanned locations in Baghdad, Al Asad Air Base, above, and Irbil in 2015. For 75 years, the USO has followed military members wherever they’re stationed to provide entertainment, relaxation and a connection home. But now, with terrorist organizations causing havoc and state-sponsored disturbances looming on multiple fronts around the globe, America’s military is rethinking how it responds. And so is the USO. “The way that the military is deploying today is far different than the way the military’s deployed in the past,” said Alan Reyes, USO senior vice president of operations, programs and entertainment. [They’re] sending small detachments and small groups out all over. The USO’s initial response after the September 11, 2001, attacks was relatively straightforward. The USO followed America’s military into Southwest Asia to build new full-scale centers to support service members deployed to Iraq, Afghanistan and strategic neighboring countries like Kuwait and the United Arab Emirates. By 2007, the USO was operating three large centers in Iraq to support the 160,000 U.S. troops deployed there. The last of those centers stayed open until the U.S. officially withdrew from the nation in 2011. Similarly, by the time the U.S. troop population in Afghanistan had swelled to over 100,000 in 2010, the USO was managing eight centers in the region. Four of those—OB Fenty, Kandahar and two in Bagram—are still open today. “We’ve stayed as long as possible in every location [in Southwest Asia], and a lot of the time we were one of the last things left on the base that was available to them,” said Priya Butler, the USO’s director of operations for Southwest Asia. Currently, the USO operates several locations throughout the Middle East, including Kuwait and four locations in Afghanistan, where roughly 10,000 U.S. troops are still deployed. In addition to operating traditional centers throughout Southwest Asia, the USO also has started searching for innovative ways to serve the growing number of expeditionary forces scattered in remote areas of Afghanistan, Kuwait and Iraq. When the U.S. military stepped up its assistance to Iraqi forces fighting ISIS last year, the USO started figuring out how to go with them. 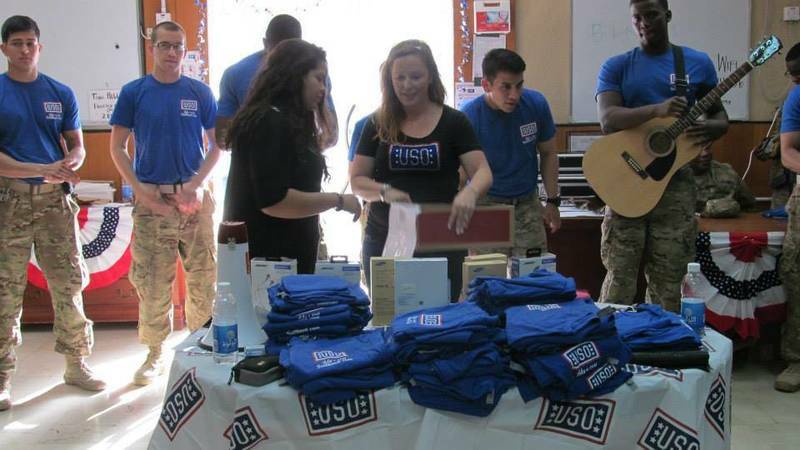 It started around Christmas, when the USO included stops in Iraq as part of its annual USO Holidays for Heroes program, which spreads holiday cheer to troops serving in remote locations. “We were there before any other support services were because we have the adaptability and the trust from our leadership to just get on a plane and go and see how we can take care of them,” Butler said. In 2015, the USO decided there was a larger need for its services in Iraq and officially opened three new unmanned locations in Baghdad, Al Asad Air Base and Irbil. Visa restrictions and other logistics issues currently prevent the USO from operating a fully staffed location in Iraq. However, these unmanned centers offer a way for the USO to directly deploy entertainment and connectivity services to the area. The new locations in Iraq are smaller, scrappier versions of their predecessors, but they are still designed to fit the immediate needs of the troops serving in the area. All three locations have TVs, gaming consoles, Wi-Fi connectivity and other core USO center services like free calling cards and snacks. More importantly, they serve as one of the few places on base where service members can relax and connect with loved ones after a long, stressful day. The USO has also adopted new ways to better serve the growing number of expeditionary units deployed to isolated areas in Afghanistan. “We have a big reach, both in our centers and at other locations where we don’t have staff,” USO Southwest Asia Regional Vice President Bruce Burda said. From USO2GO units and USO Holiday Boxes to creative offerings like Mobile Entertainment Gaming Systems (MEGS), the USO has developed innovative solutions to provide comfort and connection to even the most geographically isolated troops. Donate today to help the USO deliver some of our most popular services to military members serving in remote, isolated areas. “The great thing about the flexibility of the USO’s regional staff is that we’re able to just get on a helicopter and just fly out and make sure that they still get some USO experience during their deployment, even if they’re not on a big base,” Butler said. —Sandi Moynihan is a USO multimedia journalist. This story appears in the Spring 2016 issue of On Patrol, the magazine of the USO.